Among other things, I am an author, and book reviewer. I have just published my first book. 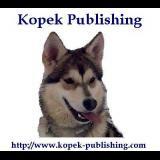 Please feel free to visit my website, where there are plenty of pictures and information on Kopek. There is also a section for having your book reviewed, and another for publishing advice. Phil and Ronnie started with two rabbits. Then along came Tim, a grouchy 11-year-old Border collie they adopted from the Blue Cross. Next, they acquired another rabbit, a guinea pig, yet another rabbit, and then a cat. Now whilst Phil has had dogs all his life, they were in the main, older rescue dogs and Ronnie's experience was limited to Tim, whom they only had for 4 years. Living with Tim introduced Ronnie to the joys of canine ownership, so when he went to the great field in the sky, it was a no brainer to look for another dog. However, they decided to get a puppy. A puppy was a new experience for both of them, and an experience it certainly was. There were plenty of incidents to cope with, as their new puppy grew up, many of which contributed to the slow deterioration of their newly renovated home. This is a collection of tales showing a three-way evolving relationship between Phil, his wife, and the new puppy. Phil and his wife have to fit the needs and character of their puppy into their sometimes opposing lifestyles. Running through the episodes is the continuous battle of wills between Phil and his natural laziness, Ronnie's love of neatness, and the puppy, often with the puppy winning. I accepted this book for review during my moratorium on accepting books for review for one reason: the wolfy puppy. You see, once upon a time I had a wolfy puppy of my own. Her name was Dusty, and she was half German Shepherd, half Timber Wolf, and all stupid. And a lot of the pictures of Kopek included in this book could have been my very own dog, which made me very happy and nostalgic. The tone of this book is very conversational (even if he does slip into tangents a bit too often), and I really liked reading about Kopek’s adventures. If you like dogs, especially chewy, mischievous ones, I think you’ll like this too. It’s a short, light read, and just the thing to put a smile on your face. This was a fun and quick read. Anyone with any experience bringing a new puppy into their home will definitely relate to the trials and tribulations, and those many endearing moments a new puppy brings. I am absolutely sure that somewhere in the many anecdotes involving Kopek and also those of his other furry housemates, you will find something that will make you laugh, and also gasp. You will quite likely be reminded of one of your own favoured pets. The pictures of Kopek are a wonderful addition and I only wished there were more that maybe included him amidst some of his handiwork. With all the mischief of an unrepentant child, Kopek will steal your heart. Recommend it? If you are a dog lover then it's a must read. Even if you're not the book is pretty funny at times plus a fast read, and I have enjoyed it despite my being a cat person (which isn't to say I don't like dogs, I just like cats more :) ). Read the complete review at Kay's Site.